Christine Gelineau is the author of the book-length poetic sequence Appetite for the Divine (Editor’s Choice for the Robert McGovern Publication Prize)and Remorseless Loyalty (winner of the Richard Snyder Publication Prize), both from Ashland Poetry Press, and co-editor with Jack B. Bedell of the anthology French Connections: a Gathering of Franco-American Poets. A recipient of the Pushcart Prize, Gelineau teaches at Binghamton University and in the low-residency MFA at Wilkes University. Gelineau lives with her husband on a farm in upstate New York. Congratulations, and thank you so much for agreeing to this email interview on the publication of Crave, your third full length book of poetry. I reference it briefly below, but just so our readers know at the beginning, this is in fact the second time I interview you. The first was in 2010 when you put me in touch with Franco-American poets around the country, and I interviewed you (and many of them) for a presentation in Montreal, which was eventually published as an essay in the International Journal of Canadian Studies in 2011. That first interview was by phone, and we were distant neighbors in Central New York at the time—you along the southern border, me close to the northern border. It’s nice to have the chance to “visit” again. OK, let’s get started with my questions, and your answers. 1. Generally speaking, the poems have to do with the relationship of public and private worlds. In the first section, “Hard Evidence,” the poems seem to be more grounded in the public implications, while poems in the second section, “Crave” they are more grounded in private life, though both aspects are in most of the poems in the book. Would you agree with this, and why or why not? How did you decide to organize your manuscript in this way? I like this question very much, especially the insight that a melding of the public and the private are the province of the poems. Unless a book springs from a particular concept, I think one reaches a certain number of poems and starts looking to see if there are any ways in which the poems speak to one another productively that might suggest a collection. The first time I went looking for that in this group of poems, my initial focus was on a kind of plain-spokenness in poems like Hard Evidence, Grace, Physical, What Men Do, etc. and the words “Seeing Things” came to mind as a book title. I could see I was immediately attaching to that title and that notion of what organized the poems so before I got too infatuated I googled Seeing Things to determine if it was "available." No doubt many will know that I quickly discovered Seamus Heaney had beat me to that title a good number of years ago. So back to the drawing board. I wrote some more, fiddled some more, and gradually I began to notice there were poems with a kind of stubborn insistence on something like optimism, or at least a desire and hunger for more that continued to propel us in a sensation of moving forward and I began to attach the word “crave” to that impulse. Maybe in part because I already had a poem called “Hard Evidence,” it next occurred to me that there were a number of other poems that looked at the many instances in which the world presents us with hard evidence that would seem to contradict that impulse to crave. From there it was easy to make the decision to group the “hard evidence” first, and allow the poems that “crave” to have the last word. Perhaps your sense of the public and the private in the poems suggests that much of what knocks us down emanates from the wider sphere while much of what sustains us is embedded in the private. I would have to think about that some more but I was interested to hear what qualities you saw the poems as sharing. 2. I know from FRENCH CONNECTIONS: A gathering of Franco-American Poets, and the interview you granted me when I was researching Franco-American poets, that we share a Franco-American heritage. And that your husband is Jewish, and you live on a horse farm. Would you talk about how any or all these facts influence the poems you write, and those you chose to include in Crave? I do not think of my poems as a variant of memoir, nor do I try to occlude their grounding in aspects of my actual life. Family heritage is a fact and factor and thus is likely to pop up now and then. Poems like “Morning Prayers” and “Fill” have settings that reflect some small sliver of Judaism in America , and the poems I wrote about the two weeks I was able to spend in France in May of 2013 are included in CRAVE. My mother’s parents both immigrated from Ireland and the poems from the trip to Ireland are in the first book REMORSELESS LOYALTY. I am interested in cultural connections such as those but would hope that any claims those poems might seem to make about speaking for a group are very small and tentative claims, as that’s the most I would feel comfortable with claiming. In her poem "Sources" in the book YOUR NATIVE LAND, YOUR LIFE, Adrienne Rich considers the cultural narrative of "special destiny," a concept appropriated by the Pilgrims from Jewish tradition, and then folded into the narrative of America. I like that poem's interrogation of how "special destiny" can at once be "a thought often peculiar to those / who possess privilege" but simultaneously "the faith / of those despised and endangered // that they are not merely the sum/ of damages done to them." A heritage cannot avoid being an inclusion and exclusion, a comfort that we have to be alert to when it develops the potential to be a cudgel. When your identity enfolds "American," "French Canadian," "Irish," and through your husband and children, "Jewish," then like Rich one occupies a position of privilege and dispossession simultaneously. Finding the language to speak about racial and cultural identity is surely one of the vital conversations of our times. As to the horse farm, the opportunity to have lived a life among other-than-human animals of the size and power of horses seems to me the very best grounding I could ever have had for poetry. Riding is a physical language you speak with the whole of your body to another species. Rhythm is embodied, incorporated. The skilled rider, like the poet with the emerging poem, does not control the horse; rather she learns to control herself in order to allow the horse the opportunity to express itself. What could be better training for a poet? 3. The “Crave” section especially contains what I would call life course poems: from pregnancy with your children to your long term marriage to the birth of grandchildren. (At least I’m assuming you are writing about your life and not the anonymous life of “the speaker”). When were the various poems written and what was you rationale for including them in the same manuscript? The poems in CRAVE have all been written since APPETITE FOR THE DIVINE, my previous book, was written. APPETITE came out in 2010. So these are the poems written since then that seemed to me (and happily apparently also to my editor / publisher) to work as a collection. 4. Would you tell us the story of poem, “Sockanosset,” and how you won the Pushcart Prize for that poem in 2013? I have Patricia Smith to thank for Sockanosset. She was teaching a workshop at Binghamton University and suggested an exercise she had “borrowed” from someone else (whose name, I’m afraid, I cannot recall). The idea was to hand draw a map of your childhood neighborhood and see if any ideas for a poem leaked into the process. I had long wanted to write about this memory of us neighborhood kids pedaling our bikes around the neighborhood looking for clues that might lead to the boys who had recently escaped from the nearby reform school. I think what allowed the poem to move forward that time was the realization that the poem’s true point of view was that of the escaped boys. Maria Mazziotti Gillan published the poem in Paterson Literary Review and then later that year Lee Upton kindly put my name in as a nomination for the Pushcart Prize, which allowed me to submit three pieces I had had published that year for consideration for the prize. The Pushcart had two guest editors and I have to believe it was Maxine Kumin who pulled my poem out of the slush pile of nominations and that it was her notice of it that allowed the poem ultimately to be chosen for the edition. Thanks to Bill Henderson, of course, for his indefatigable work producing Pushcart all these years, including that one, but then thanks to the posse of women who inspired, supported, and championed the poem along the route to that selection. 5. I also appreciate how grounded in the rural life and the body many of the poems are. They are not anti-intellectual, but neither are they steeped in intellectualism. Would you comment on whether you think there is an academic/industry bias toward urban intellectualism and a mind-body split in much literature today? Now this question I love. As you can see from my comment on the horses earlier, I would identify this inclusion/melding/prioritizing of mind and body to be a core value to my aesthetic. To my understanding of poetry, it is crucial to have the body, not only the mind, in the poem--in its content, in its rhythms, in a kinetic, physical sense of the poem as a made thing. A significant percentage of the poetry published in our culture that gets the most attention is certainly published by and produced by poets with an urban sensibility. Is there really any debate over the idea that New York City, and to a lesser extent a number of other urban centers, have the most impact on what content, modes, and names are considered most significant in contemporary American poetry? Just because you live in an urban area doesn't mean you have to champion only work with an urban perspective to it but don’t we all find perspectives closer to our own easier to enter? And haven’t those of us involved in poetry all encountered some degree of dismissal of “nature poems”? Inevitably we are all “rural,” all dependent upon the health and well-being of this one and only planet but the utter dependence of urban centers on the rural areas that support them can grow invisible to city dwellers. The impact of that on poetry promotion is, of course, not the most important of its impacts but we poets do think about it. I have a panel proposal in right now to AWP for the 2017 conference in Washington, DC on the topic of The Nature of the Natural in Poetry Today: Postpastoral, Antipastoral, and Beyond. I hope to have the opportunity to have more to say (and hear about) the topic then. 6. What is your favorite poem in the book, and why? I don't usually think in those terms. I like “Anniversary in Paris” because lyricism is my first love and because "happy" poems are so challenging to write, but each of the poems has some moment or aspect I favor. I'd be more interested to know what is your favorite and why? 7. What’s next on your writing agenda? I also love the essay form and I've been working on shaping up a book-length collection of my essays. Any potential poetry projects are too young and tender to be talked about until they've had a chance to more fully develop. But thanks for asking. 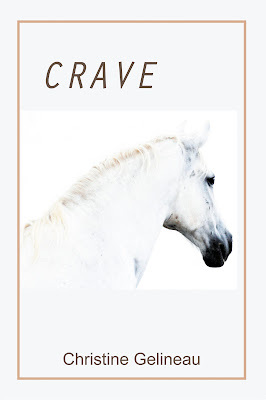 The front cover of Crave pictures the neck and head of a white horse on a white background. It looks away from us, toward the edge of the page. Toward what it craves? Any of you who know horse energy, as well as those who don’t, will find satisfaction for your poetic cravings between the book’s covers. Crave is a meaty, earthy book of narrative and lyric poems rooted in Christine Gelineu’s rural life on a horse farm. Many poems also concern matters beyond the farm. The book is divided into two sections: “Hard Evidence” consists of fifteen poems that recount what destructive cravings can cost the human soul and society, and “Crave” consists of 31 poems about cravings that push life along, through good times and bad, but ever forward. The half-dozen poems that have to do with horses left me feeling like the book is about horses, for that kind of energy drives the poems in this book about the powerful rhythms that fuel life in our earthly bodies. Also, in line with poetic trends, there are several Ekphrastic and other form poems in a text of predominantly free verse poems. The poems in the first section, “Hard Evidence,” recount public and private events, both local and international. They touch on the personal cost of ignorance, betrayal, criminal behavior, and just plain difficult circumstances. They are heavy reading, and could discourage one from reading on, but that would be a mistake, so please, keep turning the pages. “What Men Do” is one of Gelineau’s horse poems from this first section. It combines a personal story about an injured farm cat that had to be put down with an account of World War I Australian soldiers who brought their horses to war, but were not allowed to bring them home for fear of carrying new diseases back to their island country. The personal event: “While he aims, hesitates, she/waits. He shoots,/then again to be sure.//Apologists call it “the final kindness.”/What men do when they live up/to what is owed.” These sentiments will be familiar to anyone who has had to have a cat euthanized, particularly if one is acquainted with rural and farm life. The Australian story is much less common, and I was glad of the preparation the cat story provided. in what their bodies could do. Some of us spend time pondering the cost of war—in money, lives taken and damaged. How many of us ponder the cost of war to animals—horses, dogs, dolphins we recruit, or animals we simply encounter in the execution of war in theater. And to the animal soul of people attached to these creatures. The poems in Part 2, “Crave” I would characterize as life cycle love poems: love of the physical life, the land and the world, love in birth and death, animal love, family and maternal love, love of art, married love, romantic love, and sexual passion ( of corn, among other things). For me a number of poems, some mentioned below, also hint at tribute to great poets who have gone before. “Orbit,” the first poem in the section is an ars poetica prose poem that puts me in the mind of Maya Angelou’s ‘Phenomenal Woman.” It is a sassy, musical dance with “verbs hot enough to broil a sausage on, even cooled it is too saucy for the gander.” It joyously tugs and grinds the reader out of the somberness of the first section of the book. “Felt like a Thought” is about the wonders of the fall season in the Northeastern United States. The references to “the tumult of geese chevrons/clamorously rowing the skies overhead,” provide an almost iconic image of the region referenced by so many poets, including Mary Oliver. “Curing” tells the story of life in a family house from the time of its building, to the raising and sending off of children and generations of horses. “These days I stand in the past even when I am/most present, most in the present, my memories the element/through which I experience experience. Is this richness?//or rigidity?” A phenomenon and question well known to those of a certain age. The first two lines of “Grace,” a poem about a dying friend are: “If you’re lucky, at some point/ordinary life becomes itself: something to inhabit, rather than/something to pass through. “ A better description of an embodied life is hard to find. the long-married plant a tree. Fall in love in a foreign language. shadows of dusk now, sing. Welcome into yourself the evening’s holy silence. I can’t think of a better way to end in that song, or this review. Caroline LeBlanc, former Army Nurse and civilian nurse psychotherapist, has had her essays and award winning poetry published in the US and abroad. In 2010, Oiseau Press published Smokey Ink and a Touch of Honeysuckle, her chapbook about life as an Army wife and mother, and the descendent of 17th Century Acadian/French Canadian settlers in North America. As past Writer in Residence at the National Military Family Museum, she wrote the script for the museum’s traveling exhibit, Sacrifice & Service; co-produced and co-created the script for Telling Albuquerque and 4 Voices stage performances; and facilitated Standing Down, a NM Humanities Council book discussion group for veterans and family members. 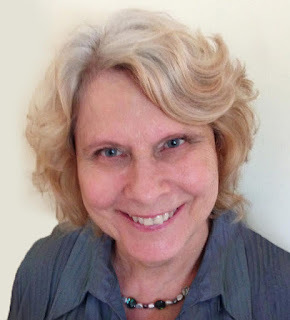 With Mitra Bishop, Roshi, Mountain Gate Zen Center, New Mexico, she offers veterans and women military family members Day of Mindfulness Meditation & Writing Retreats. She also serves as clinical staff for Mountain Gate Regaining Balance residential retreats for the same individuals. Before leaving the Fort Drum, NY area, in 2012 she offered Writing For Your Life programs to wounded warriors and military family members. In 2011, Spalding University awarded her a Masters of Fine Arts in Creative writing. Her art has won awards in New York and New Mexico. She is a member of Albuquerque’s Rainbow Artists Collective, and a founding member of the Apronistas Collective of women artists who regularly mount community art shows highlighting women’s rights and ecological issues.